While Creative Labs was hard at work marketing their "revolutionary" AWE64, the engineers at Guillemot had something else planned for the future of the PC sound industry. How would you like to have the power of a $3000 Sound Editing System for under $200? With Guillemot's Home Studio Pro 64 that dream can very well become a reality. Out of the box the Home Studio Pro 64 is an amazing product, available to the public only in a retail version the bundle packaged with the card includes the Home Studio Pro 64 card itself, a S/P DIF (Sony / Phillips Digital Interface) I/O daughter card, a microphone, user manuals consisting of a Hardware Installation Guide as well as two software manuals, a drivers/utilities CD, a Learn & Play - Classic Rock Guitar CD, and a midi/joystick Y-splitter cable. While that may seem like a mouthful and possibly overwhelming for a simple sound card, every last drop of it is definitely beneficial to even the most inexperienced user setting up his/her very first sound card. 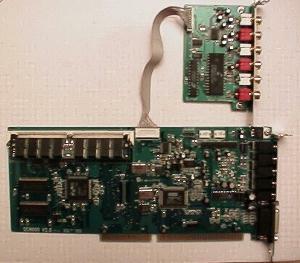 The Home Studio Pro 64 card is a full length 16 bit ISA card measuring approximately 9" in length. Although fitting this card into a cramped case or even onto an AT form factor motherboard may be a bit of a chore if even possible, the space taken up by the Home Studio Pro is not a waste at all. Guillemot managed to fit their powerful audio chipset, 4MB of on-board RAM which features 128 General Midi Instruments, 97 variation sounds, and 200 percussion sounds (16 drum kits) all on to a single ISA card.. The card also sports 2 feature connectors (one for the S/P DIF I/O Daughter card), and a 72pin SIMM slot for memory expansion. The card itself features five 1/8" Input / Output connectors: Line Out Output, Speaker Output, Surround Output, Microphone Input, and a Line In input, in addition to a single joystick/midi port. Remember that midi/joystick cable mentioned above that was included in the package? That extremely long cable allows the user to make use of the midi input/output capabilities of the Home Studio Pro 64 without sacrificing any functionality of the joystick port. Like most high quality Sound Cards, the Home Studio Pro 64 does support the use of a 4 speaker configuration to truly place the user in an arena "surrounded by sound." Most sound guru's out there are now shivering at the thought of being limited to a horrible five 1/8" I/O connectors for interfacing with all of their high quality equipment, however with Guillemot behind the wheel you won't have to worry about quality recording because when you take the Home Studio Pro 64 out for a spin it comes fully equipped with gold plated RCA connectors. Rather than featuring a single set of gold plated RCA connectors at the sacrifice of a few 1/8" inputs Guillemot chose the add-on board approach to solving this engineering constraint. 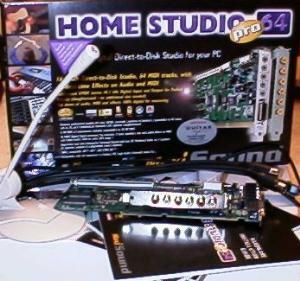 By packaging the Home Studio Pro 64 with an add-on daughter board Guillemot managed to satisfy nearly everyone remotely interested in upgrading their current sound card. The tiny 2.25" daughter board features 3 gold plated sets of RCA connectors consisting of a S/P DIF Out, a S/P DIF In, a Direct from DSP Line Out Right and Left, and finally a Direct to DSP Line In Right and Left. What can those gold plated RCA ports be used for? Well if you're into sound you know that recording to/from a RCA port yields a noticeable increase in quality over recording to/from a standard 1/8" connector. In a more practical manner, those gold plated RCA ports can be used for higher quality recording from an external source or for exporting sound to another device, the test system the Guillemot Home Studio Pro 64 was installed in exported audio to a recordable mini-disc unit although the Home Studio Pro 64 is versatile enough to export audio to nearly any imaginable format accepting either an 1/8" or RCA input. The quality of your recordings made using the HSP64 is also accented by the card's dynamic noise filter which is used to produce an exceptional signal/noise ratio. Fortunately, Guillemot's daughter card does not occupy an ISA slot like the main Home Studio Pro card, instead it populates a slot cutout on the back of your case and interfaces with the main card via a short proprietary feature connector cable. 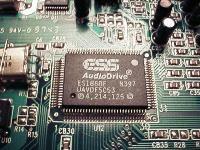 While it was designed to be placed in a cutout adjacent to the HSP64, the cable is long enough to navigate over one ISA card in order to connect to the Home Studio Pro 64. However it isn't recommended that you separate the daughter card from the main card by more than the space of 2 ISA slots, not only will the cable experience troubles reaching the main card but you also risk physical damage to the cable. The feature connector cable is much like a tiny Ultra Wide SCSI-3 cable in that the cable is very easily detachable from either of the cable heads (the things that actually connect to either card). I do not recommend removing the cable once it is initially installed since uninstalling the snugly fit cable could result in actual damage to the cable which can't really be purchased at your local computer hardware store. Stretching the cable to its limits could also very well result in the same scenario described above so treat it with care as if it were a newly born infant cable. Taking advantage of the daughter card can't be done immediately after opening the box since Guillemot failed to include any RCA cables, nor any 1/8" to RCA converters for that matter with the Home Studio Pro 64 meaning that you will have to make a quick trip to the nearest audio/video store to pick up a few. If you are upgrading from an existing sound card, it is highly recommended (and in most cases absolutely necessary) that you remove any dormant Sound Card drivers which may cause conflicts with the product you are about to install. The test system the Home Studio Pro 64 was installed in had previously housed a Creative Labs AWE64 whose 4 driver listings were removed completely by going into Windows 95's Device Manager (Start ~> Settings ~> Control Panel ~> System ~> Device Manager) and removing any and all entries placed in the Sound, Video & Game Controllers tree by Creative's drivers. This same procedure can be performed for any sound card installed however if you are using any type of DOS Sound Drivers (which would be located in your autoexec.bat or config.sys files) be sure to add the statement REM and then a space to all instances essentially voiding them or simply delete the file calls from either or both of those two files. Guillemot's Hardware installation manual provides many descriptive pictures depicting the installation procedures required to get your Home Studio Pro 64 up and running. The Hardware installation manual also provides a fairly in-depth troubleshooting section for any problems you may experience with the product. After removing the previous sound card drivers and installing the Guillemot Home Studio Pro 64 the ABIT LX6 Pentium II - 300 based system experienced a normal boot-up process until the Windows 95 desktop was loaded during which the "helpful" Hardware Installation Wizard popped up with an alert that it had found new hardware. By using Maxi Sound's provided driver CD-ROM up to 4 devices will be added to your Sound, Video & Game Controllers section of Device Manager: the Maxi Sound 64 Home Studio Pro Audio Codec, Maxi Sound 64 Home Studio Pro Audio Joystick, Maxi Sound 64 Home Studio Pro Audio Registers, Maxi Sound 64 Home Studio Pro MPU-401 & Waves. Even with the tiny conflict the Maxi Sound 64 Home Studio Pro MPU-401 & Waves driver experienced with an unknown component in the system (the conflict simply required the disabling of Windows 95's automatic resource assignment from the Device Manager Control Panel) the total installation time for the Home Studio Pro 64 was under 10 minutes. 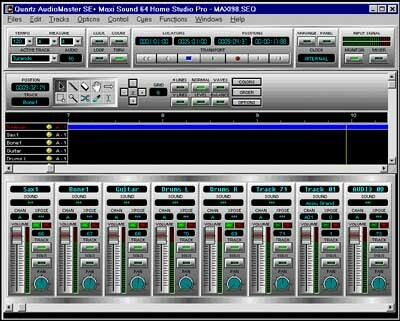 After a quick reboot the user has the option of installing the Maxi Sound software package which includes Maxi FX Home Studio, Quartz's AudioMaster SE, the Maxi Bank Downloader and Maxi Memory 64, Sound Impression, CakeWalk Express, and Internet Phone 3.2. The Maxi FX Home Studio is a great addition to the overall Home Studio Pro 64 experience, mainly because the Maxi FX program functions as a tuner remote control for your newly installed Sound System. It allows you to select from various pre-defined settings or create your own settings which apply surround sound, Chorus, Reverb, Equilizer and Echo effects in your normal sound operations. AudioMaster SE is a fairly simple program in operation yet complex in application which is basically your own digital recording studio that allows you to use its 16 track recording capabilities to produce MIDI files or export other types of audio files. 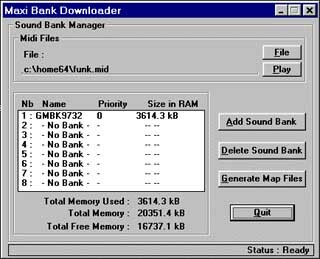 The Maxi Bank Downloader is a program that actually makes use of the onboard (and upgradable) RAM of the Home Studio Pro 64 by allowing the user to load sound banks for use in MIDI applications. 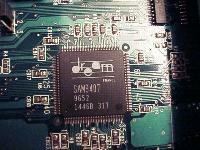 Remember that 72pin SIMM slot? Well that little baby can accept either a 4MB or a 16MB (60ns or faster) standard 72pin SIMM therefore expanding the usable memory of the Home Studio Pro 64 to 8MB or 20MB respectively. Remember to set the jumper indicating the memory installed when upgrading the HSP64 otherwise it will by default only recognize a total of 8MB installed even if you have installed an additional 16MB. 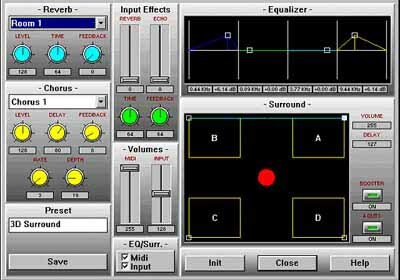 If you're into MIDI files you'll simply love CakeWalk Express, a midi-sequencer which allows you to manipulate MIDI files in virtually any way, shape or form. You can either use the Home Studio Pro 64's on-board MIDI Synthesizer or you can use the provided MIDI I/O cables to make use of a keyboard or other MIDI instrument for recording/editing MIDI files. Why on Earth would you package IPhone with a sound card?!? Well, to make good use of the full duplex (simultaneous playback/record) features of the Home Studio Pro 64 to enable real time phone conversations over the Internet without any hassles. 64 or 32? Index 64 or 32?